Sensory-based activities are the ultimate way to bring playful learning explorations to preschoolers. Using all 5 senses in learning activities promotes problem-solving skills and investigation. In this fun activity, preschoolers will sort items based on the corresponding sense the items belong to. 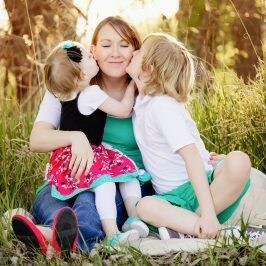 Preschoolers can then be challenged to go on a 5 senses scavenger hunt. Find everything you need to explore all 5 senses in preschool with hands-on sensory sorting activities. Exploring All 5 Senses in Preschool: Sensory Sorting Activities and Books! Disclosure: this post and others within the blog contain affiliate/distributor and/or sponsored content and links. While we try to remain advertisement free for our readers, we do earn income through purchases you make from the blog. Please see our disclosures policy for more information. 5 trays or cookie sheets (note: dollar stores carry inexpensive cookie sheets for playful learning activities with preschoolers). 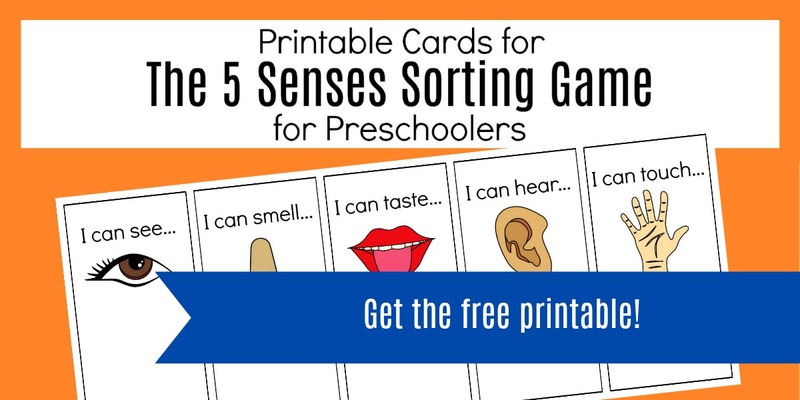 Print the 5 senses sorting signs. You may choose to laminate them for durability. Cut them out and secure them to the sorting pans/trays as seen in the images below. Once the sorting pans/trays are labeled, set them in the Science center and create an invitation to play. 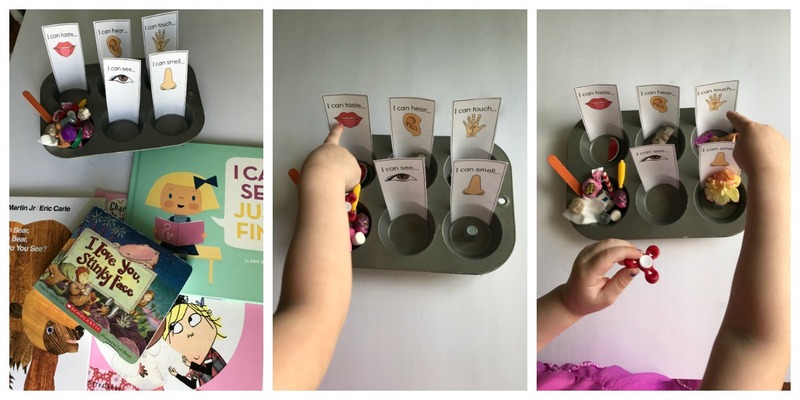 Invitations to play are eye-catching arrangements of learning materials that draw young learners into an activity based on curiosity and with little adult encouragement. The trays can be purchased cheaply at the dollar store and can help to keep smaller activity pieces together. 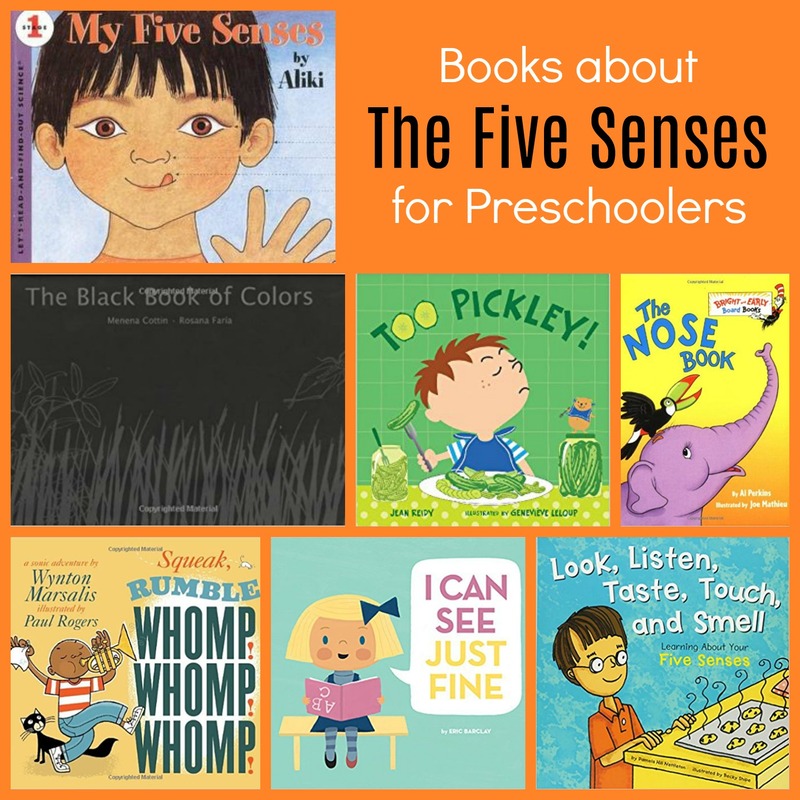 You may also want to stand up some books from the list below that focus on the 5 senses. For a touch of whimsy, you could even add a Mr. Potato Head with just parts that correspond to the five senses. When children use their five senses in learning activities, they are encouraged to investigate and explore. 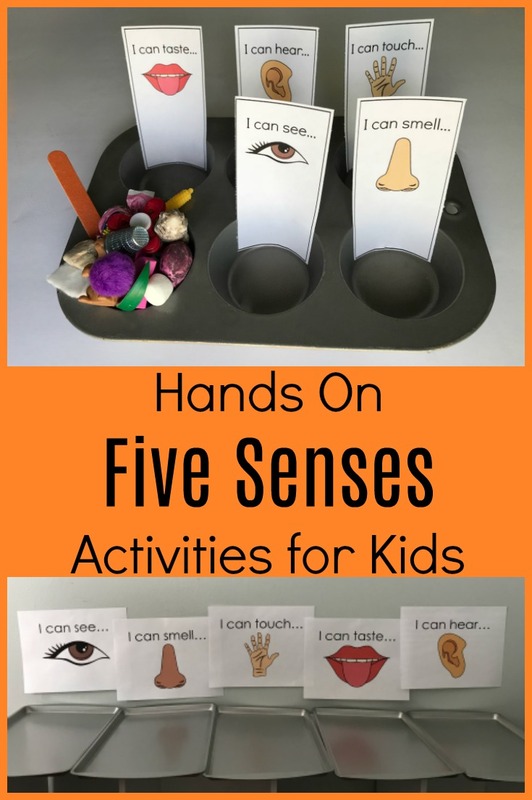 Not only do these activities encourage brain development and problem-solving skills, they also prompt children to use scientific thinking, which can be demonstrated in this five senses sorting activity. There are two parts to this activity; the first can be completed independently and the second can be done as a group activity or independently as well. The second portion of this sensory activity is in the form of a scavenger hunt. 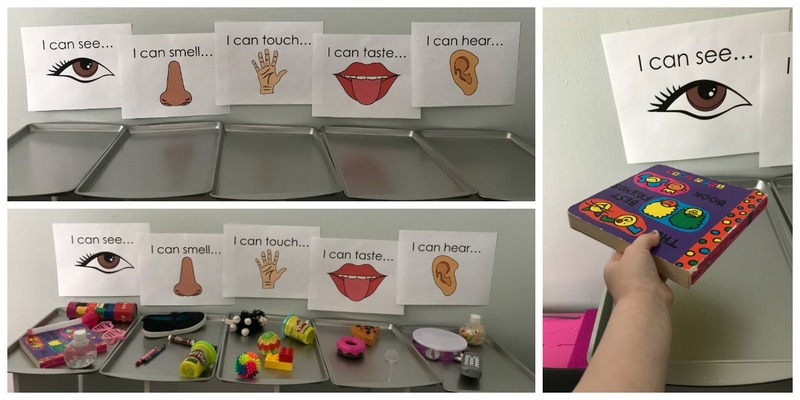 Place the cookie sheets/trays out along a table with the “I Can See/Hear/Taste/Smell/Touch” printables posted on the wall/table above them. Challenge children to search the room for one item for each of the five trays. Once done, discuss how each item on the tray relates to that particular sense. It is important to note that for both of these activities, while adults may have a set answer for where each item “belongs”, the minds of children work in wonderfully creative ways. Where one child may sort the sandpaper under touch because of how it feels, another may file it under sound due to what happens when the paper is scratched. If you see an item and do not understand why a child has classified it under a particular sense, as thoughtful questions to gain insight into the child’s line of thinking. Take a listening walk or I-spy walk through the neighborhood and see what sounds/items children can see and hear. Try the free printable to locate various items on your walk here. Have a taste test of various types of flavors: salty, sweet, sour, mildly spicy, etc. (To record various foods your preschoolers try, see here). Make your own I-spy book like these ones. Create a “blind box” for children to feel a secret item and guess what it is as seen here. Have a smelling test to see if children can name the item they’re smelling. Let children flip through magazines and circle eyes, ears, mouths, noses, and/or hands. Make egg shakers like this to keep rhythm with. 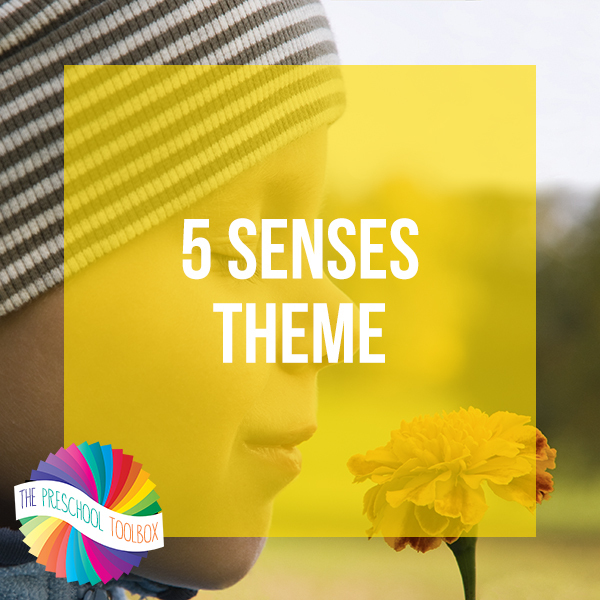 For even MORE playful learning with ALL 5 Senses, see our 5 Senses Thematic Unit here on the blog. The theme contains literacy, science, math, songs/fingerplays, arts/crafts, and small/large group dramatic play ideas for the 5 Senses.